This tutorial is about adding the devices and sensors to the PRTG network. This might sound like a piece of cake but it is a complicated and technical aspect. There a number of sensors available in application to let you fetch data from your device but choosing the right ones depending on your requirement. If you choose the wrong sensor or device then you may have to face downtime as well so be very vigilant while adding devices to your network. 1. Open the PRTG in your web browser, enter username and password. 2. There will be a blue tab at the bottom of your display, click add device. Now select the category under which you want to add the device, this is merely for preview there is nothing technical in it. click next. 3. Add the IP address of the device that you want to add to this tool, keep this thing in mind that only same network devices can be added to this. Also, give a name to your device. 4. Keep the device type automatic device identification(standard, recommended). 5. Now on the home page, look for the device that you added, click on the device look for add sensor. 6. Select ‘monitor what?’ then select ‘target system type’ and select ‘technology used’. 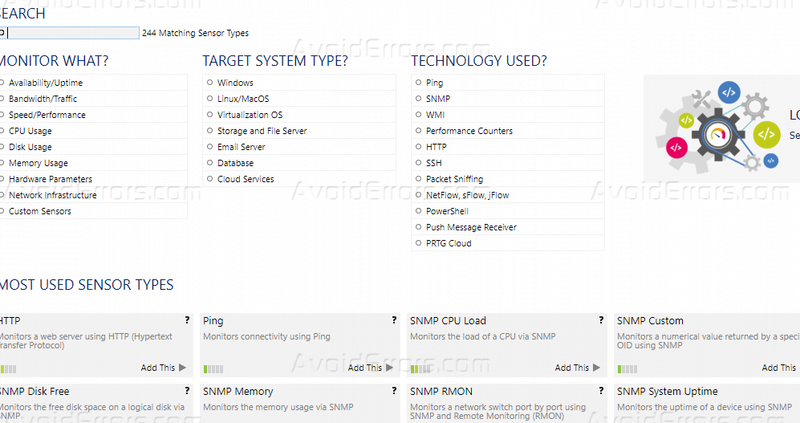 These are the most commonly used technologies like ping, SNMP etc., if your requirement is beyond that then you may find a number of available extensive sensors that include SNMP traffic etc. Select your sensor. Note: Before proceeding any configuration please enable SNMP on your respective device. Sometimes it also requires to enable port listening so also keep that in consideration if in case PRTG does not respond to your device. Also, disable the firewall in such scenario which is blocking your traffic to get through.